Bank Transfer - you can pay by bank transfer. Please phone or email for bank details. Always ensure that you put your address as a reference. Cash - we accept cash at the door, although we prefer other methods to protect our staff. Cheque - we accept cheques at the door or if you are not in we provide you with a self-addressed-envelope to post the cheque to us. Always put your address on the back. Pay Pal - we accept PayPal. For your safety and security, all transactions are processed through Paypal's secure servers. 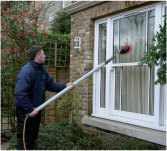 Your credit card and bank details are at no point in the process disclosed to H2O Window Cleaning.